Yesterday during Jurgen Klopp’s press-conference, Liverpool’s manager explained why Virgil van Dijk skippered the side against Red Star on Wednesday night. Van Dijk was the winner, with his Dutch compatriot Gini Wijnaldum second. 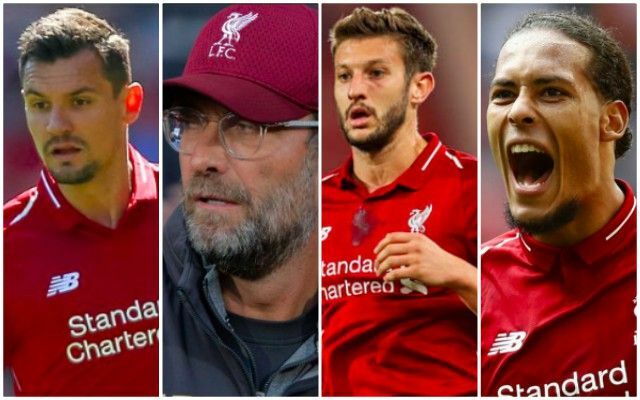 Klopp has expanded on the decision, claiming that Adam Lallana and Dejan Lovren also received votes, while explaining why van Dijk won. “I really think Milly and Hendo are doing an outstanding job for the club and the team. Being ambassador for the club on one side and impressive for the team on the other side is brilliant. They combine pretty much everything,” he told FourFourTwo. “When I came in I built a players’ committee. There were five, six players including Lucas Leiva, Adam Lallana and Phil Coutinho. This team has grown now and they all have very, very demanding and confident players in the squad so you can decide who of them you want. “It was a close decision. Dejan [Lovren] was close, Adam was close. They all had their votes. The players see it in the right way – that the players could do the job. “Virgil is still young. He looks more of a man than he really is. There is nothing wrong with that and he can still improve. If you see and hear him, you think there is a big distance between him and you because he looks quite impressive. Van Dijk could captain the side today against Cardiff with Jordan Henderson injured and James Milner not guaranteed to start – due to Fabinho’s brilliant outing v Red Star Belgrade. Many Liverpool fans want van Dijk to be our skipper permanently, but Hendo does a good job and Klopp would make the switch if it was necessary. Liverpool are heavy favourites to beat Cardiff at Anfield today, and will go top of the Premier League if we do, with Manchester City playing Spurs on Monday night.